I hope you'll play along in our Anything Goes challenge. Link up your creation at the Catch the Bug Blog so you can be in the running for prizes. You don't HAVE to use a Bugaboo image for 2nd and 3rd place but you do have to use one if you want to win the grand prize of TEN images. THis is super fun and festive, Lori! I just had three birthday daughters in December and your card is very inspiring :) It's nice to "meet you!" I look forward to working with you in the coming months as a GDT on The Bug! Blessings! 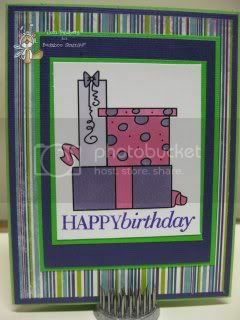 This is a very cute birthday card! Wonderful coloring too!